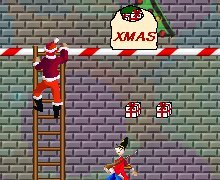 Marty Saves Christmas is a platform game much like The Mother of All Games. As usual you jump and run to the door to the next stage avoiding numerous enemies and traps, which fortunately can be fought with the traditional superballs. Some paths must first be opened up by activating switches, and in order to cross spiked floors you better look for a Magic Potion. And don't forget to pick up presents to earn extra lives. There are also pieces of armor protecting you from one hit each. The automatic save feature allows you to start the game at any stage already reached before, but it is also possible to suspend a game in progress. The game can be played using the keyboard or a joystick and consists of 20 levels plus a tutorial and detailed instructions, as well as a high score table. The story is told in entertaining cutscenes, but you can also disable them if you wish.